The city museum in Meissen is a fragment of a former monastic house. The main building is part of the original church and has cloisters (kreuzgang) attached that house a variety of funeral monuments gathered from former city churches and churchyards. Among them are a number of eighteenth-century memorials, some of them free-standing. 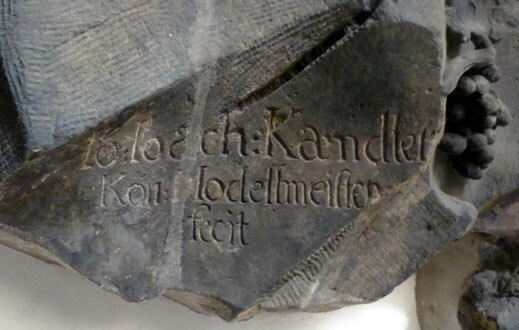 One that is fixed to the wall is that to Maria Rebekka Schlegel, who died in April 1736, aged 40. (Fig. 1) She was the wife of Johann Friedrich Schlegel, whose monument is also in the cloisters, and the mother of Johann Elias Schlegel, a playwright, and Johann Adolph Schlegel, a poet and clergyman. She is seated to the left of the inscription tablet, turning towards the inscription and pointing with her right hand (now gone) while somewhat inadequately supporting a crying baby against her skirt with the index finger of her left hand. To the right of the tablet the figure of Time strides towards her raising an hourglass high in his right hand while clasping the long wooden handle of his scythe in the other. It is a dramatic composition, very much of the same era and content as memorials in England by Louis François Roubiliac, although the figure of Time lacks the characteristic tuft of hair above the forehead that such personifications in England have prominently displayed since the early seventeenth-century. Johann Joachim Kändler was born near Dresden in 1706 and trained as a sculptor in that city. From 1723 he was a pupil of Johann Benjamin Thomæ. In 1731 he was appointed court sculptor to Elector Friedrich Augustus I (Augustus the Strong), as his master had been in 1712. Shortly after his appointment he was summoned to the Meissen porcelain factory to work as a modeller, nominally under Johann Gottlieb Kirchner, although he was paid considerably more than Kirchner. He became chief modeller (modelmeister) on Kirchner’s resignation in 1733, a position he held until his death in 1775. 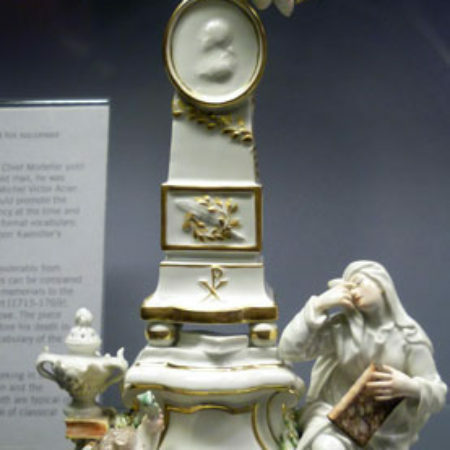 It was under Friedrich Augustus’s sponsorship the secret of making hard paste porcelain in the manner of the Chinese was discovered and put into practice at Meissen. From 1764 Kändler shared the post of chief modeller with the much younger French sculptor Michel Victor Acier. Other than that to Frau Schlegel, Kändler’s only other signed monument is that to Alexander Miltitz, died 1739, in the church at Naustadt near Meissen, although others in the cloisters of the Stadtmuseum are attributed to him or his workshop. The major sculptural programme in Saxony during the early eighteenth-century was at Augustus’s new palace, the Zwinger in Dresden. The programme was under the control of Balthasar Permoser, appointed court sculptor in Dresden in 1689 following an Italian training. 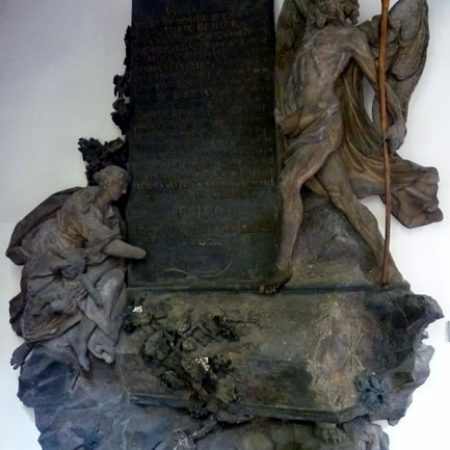 Because of the sheer size of the programme, which ran from 1708 to 1728, Permoser needed assistance from other sculptors, who included Paul Heermann, Johann Benjamin Thomae, Johann Christian Kirchner (appointed as court sculptors by 1705, 1712 and 1717 respectively) and Kändler himself. It is no wonder that Dresden became a centre of attraction for sculptors and it is known that Roubiliac underwent some of his training there around 1718-20. 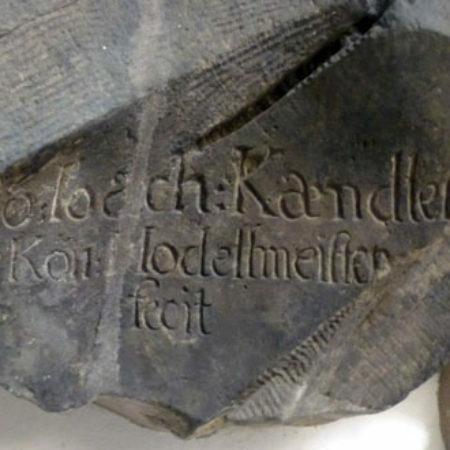 Although it may seem that Kändler’s career took the reverse course to that of John Bacon the elder, Bacon beginning as a modeller at Nicholas Crispe’s Vauxhall china manufactory and working as such for Wedgwood and the Chelsea-Derby concern until turning to large-scale sculpture after 1769, Kändler retained an interest in larger scale work. 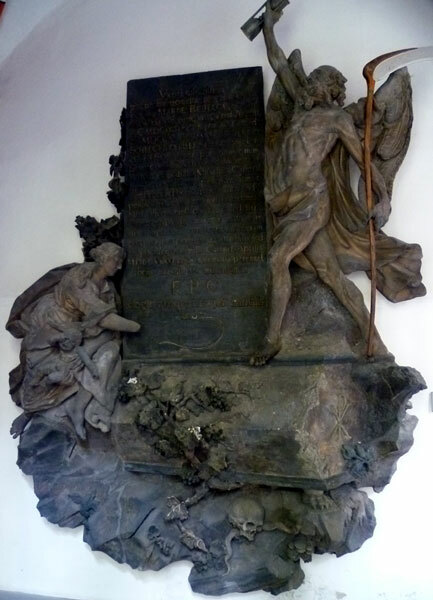 When the poet Christian Fürchtegott Gellert died in Leipzig in 1769, there was great interest in producing a monument to him. 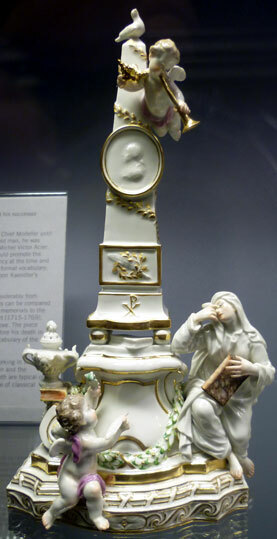 Kändler’s porcelain model, with Gellert’s profile hung on a tall obelisk (Fig. 3), stands in a cabinet in the factory museum in Meissen next to Acier’s model of the monument that was originally erected in a private garden in Leipzig, designed by Gellert’s friend Adam Friedrich Oeser and executed by Friedrich Samuel Schlegel. The latter was responsible for Gellert’s monument in the Johanniskirche in Leipzig, of which a Meissen model by Acier is in the British Museum. Although a number of porcelain examples of Kändler’s design survive, it was seemingly never executed as a full-size monument. One wonders whether porcelain models for existing monuments by Kändler survive in the Meissen factory stores.